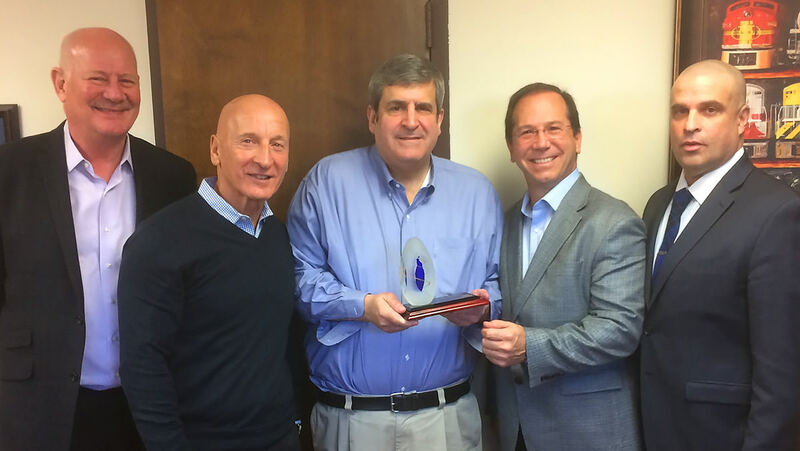 In December 2016, American Biltrite presented Michael Halebian & Co. with its Outstanding Performance Award, which is given to the American Biltrite distributor that achieves the highest growth during the year. This was the first time Michael Halebian & Co. won the award. Louis Soscia, Director of Sales, describes Biltrite as a committed business partner. He said, “American Biltrite is a good fit for the segments we serve most, especially applications in health care, education and multi-family housing.” That synergy comes in part from American Biltrite’s technical ability to develop high-performing flooring systems and their commitment to developing products free of phthalates, lead, mercury and polyvinyl chloride, among other dangerous substances. American Biltrite’s AB Pure® and Marathon® rubber flooring products have met the requirements of the Living Building Challenge Declare Program, which certify that a product is free of Red List chemicals. These are the only certified Red List-free rubber flooring products in the industry. “The Declare status gives our A&D team a quantifiable product advantage when specifying AB Rubber flooring, and it supports our solution-based approach to meet our customers’ challenges,” Soscia said.